Order within 9 hours 51 minutes for Same Day Delivery! 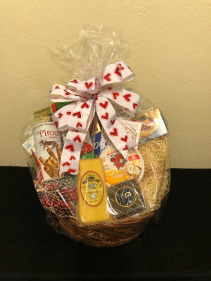 This gourmet foods basket features a variety of cookies, cheeses, dry meats, crackers, cheese spreads and chocolate. We have a perfect bow color for you too! Call the shop at (208)323-7738 to customize your order and ask how we can include a bottle of wine! Both you and the recipient must show Valid Driver's License of being 21 and older to order wine or beer products for delivery or pickup. **Some specified or pictured items may not be available at time of purchase, but we will fill your order with similar items. Please let us know of any food allergies, as some items are packaged or contain known food allergens such as soy, peanuts/nuts, and dairy. Please call the shop for details! This dish garden features an assortment of green plants for a perfect sympathy or get well gift. 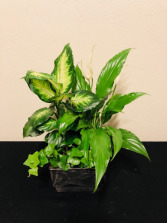 The additional prices vary for our three available sizes of dish gardens ranging from 4-7 plants or varied sizes and kinds of plants. 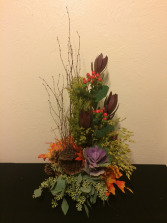 Call the shop at (208)323-7738 to ask about adding picked-in flowers for color! (additional funds required) **Some plants pictured may not be available at time of purchase. We will substitute with a similar size and type of plant. 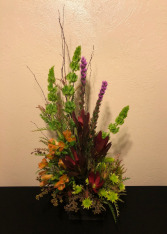 This moody arrangement features purple kale, burgundy leucodendron, broomcorn, red hypericum and seeded eucalyptus. It's linear design is accentuated by lotus pods, pine cones, birch branch and preserved leaves for a touch of fall. Call the shop at (208)323-7738 to customize your order! **This arrangement features seasonal/specialty items that may not be available at time of ordering. Please call for details. This modern display is a great flower arrangement for Him or Her! It features hydrangea, burgundy mini carnations, alstroemeria, iris, liatris and two different types of eucalyptus. It is accented by birch branch and curly willow. Call the shop at (208)323-7738 to customize your order! **Valentine's Day orders may vary in price. Please call for details. 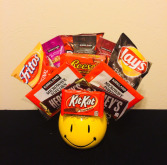 This Smiley Mug comes with an explosion of assorted chips, candy bars, seasoned nuts and microwave popcorn bags for the perfect Snack Pack! 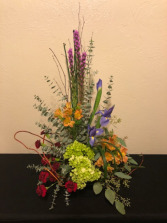 Call the shop at (208)323-7738 to see how we can Customize this bouquet for you. We have a variety of containers including this *Smiley Face Mug, Campbell's Soup Mug, Baskets, and other seasonal items such as a Ceramic Pumpkin, Treat Container, Ceramic Ornament, and mugs for all seasons! Pictures of containers can be found at the bottom of the page. **Items may vary depending on season and availability. Call the shop for more details. Having a hard time deciding on the perfect gift for dad? HEAVENESSENCE FLORAL & GIFTS can help! Send dad a artistically crafted floral tribute to show him how much you care. Perhaps your dad is the type that would prefer a gift basket filled with his favorite snacks! Whether your dad lives in Boise, or clear across the country, we've got you covered! Please place gift basket orders 24 hours In advance of when delivery is desired.